Want to learn more about caring for sugar gliders? 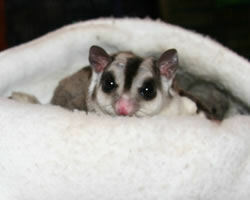 Caring for sugar gliders is much more like having a zoo in your home rather than owning a hamster. They are intelligent, form strong social bonds and require a special diet. This website a resoure for sharing things sugar glider owners need to know to make sure their pocket pets have happy and healthy lives! Hope is a wonderful glider who was rescued by the neighbor of a breeder in Irving Texas. She was found malnourished and injured in the woman's backyard. Her tail was missing, and either she'd been thrown out or had escaped. Hope was so tiny, that we didn't realize she was pregnant. In fact, she hid the joeys from us for a long time to protect them. Hope had surgery to amputate what was left of her tail on July 7th, but she self mutilated (common with abused gliders). After surgery to repair the damage she did to herself, she went to stay with Charlie and Mary of Glider Tree to recover. In October 2004, Hope came home to live with Angie Higdon--changing hers and Angie's life forever. Hope is living a pampered life in sanctuary with her twins, Love and Faith, and cagemate, Chase. And Angie--along with friends like Debbie and others--have become passionate advocates and education resources for sugar gliders. Hope is such a sweet girl, and doing so wonderful! She wants you to know what to do to help other gliders by caring for them in a way that will make them thrive! © 2018 Content inspired by Angela Hopkins-Higdon. Edits by Cathy Hutchison. Powered by Blogger.